Robert Keeley designs a better mousetrap that's red not green. Practical tonal options. Tasty, natural overdrive. Mini tone/level knobs could be hard to see. Robert Keeley has been modifying Tube Screamers since 2001, and has seen Steve Vai and Joe Satriani, among others, use his modded pedals. 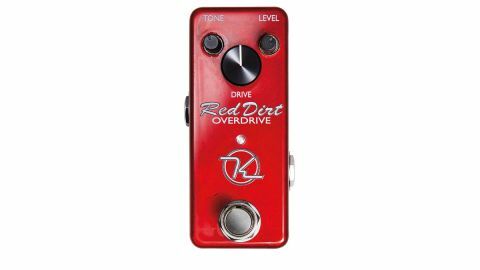 "It's a classy take on a TS-style overdrive with practical added options"
His own Red Dirt put all of those mods into a single pedal and added a JFET input buffer for a more dynamic sound, and now it's available in mini-pedal format. With a large knob for drive and smaller ones for tone and level, it follows the standard TS configuration. Tucked away under its four-screw baseplate, however, are two DIP switches that allow you to change the clipping diodes for four different modes - distortion, overdrive, crunch and amp - each cleaner than the next and all delivered with great string clarity. It's a classy take on a TS-style overdrive with practical added options. A tasty overdrive that naturally complements your sound, with versatility galore inside.